Home»All»Things to do in San Antonio, with kids (without visiting the theme parks)! Things to do in San Antonio, with kids (without visiting the theme parks)! We love taking a San Antonio roadtrip a couple times a year… and we are not really theme park people. We like them just fine… but we absolutely love to explore cities and see what makes each one unique. We’ve been making the roadtrip for the last 8 years, with kids, and just got back from the latest trip. Look below to find the things we’ve found to do, including discounts and free admission to places with our Houston Museum Memberships! Below you will find information about the Riverwalk, Museum Reach, King William Historic District, Brackenridge Park… and a San Antonio map. If you have more suggestions, let us know and we’ll try them on the next trip! This is located right across from the Alamo and the staff has great ideas… and many of the brochures have coupons for local venues. We’ve been to the Alamo and snapped pictures and we’ve been and taken the audio tour. We’ve found that taking the self-paced audio tour really makes the visit more meaningful. There is also a guided tour… but we are not confident all our kids will last through the whole thing. 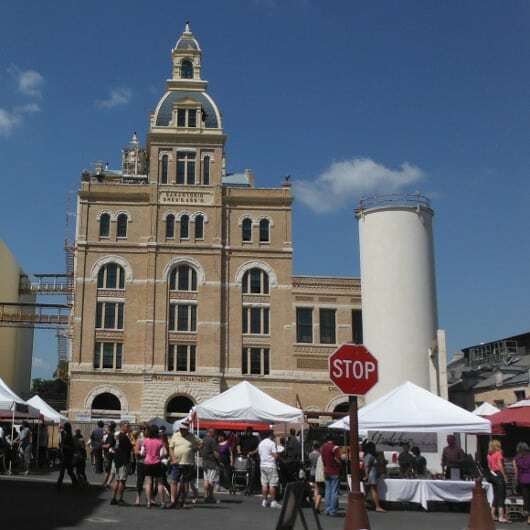 Just a short walk from the River Walk is Historic Market Square. I really like fairs and markets… and this is one that is open all year long. Here we shop in the stores and stalls, find a sweet snack at one of the booths and watch the live entertainment. This fair is said to be the largest Mexican market outside Mexico. There are a lot of tourists… but since I’m a tourist in San Antonio… it is okay with me. If you are short on time, this is the way to go. The tours take about 35 minutes and cover the downtown portion of the River Walk. The tour guide talks about the history of the River Walk and the buildings on the banks. Just know that the boats are generally very crowded during the holidays and there is often a wait for the ride. If you have more time, you can get the VIP River Walk experience by taking the Rio Taxi. Here you can cruise along the museum AND downtown parts of the River Walk… including going through the lock! Your boat goes into the lock, the doors close on both sides, and the water level gradually rises or lowers 9 feet over 3 minutes. With the Taxi, you can jump on and off where ever you want (like when the kids get antsy). Also, the taxi drivers give boat tours, so they know the history of the buildings and the river. On the taxi, many drivers will announce buildings that you are passing and river facts. Other drivers can answer all the questions you have about the river. To get a taxi, look for the markers along the side of the river. When a boat with the checkered taxi flags comes near, just wave it over and buy tickets with cash. The downside of the taxi is the timing. Although you do not need to wait in a long line, like the tour, you are never really sure when the next taxi will arrive. Our strategy was to walk along the river until we saw a taxi and then wave it down. Take the Alamo Trolley Tour: This tour lets you sit back and see San Antonio from the street car. 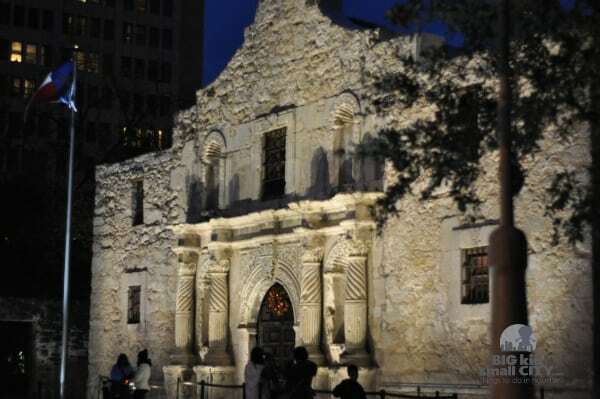 You will see the historic spots near the River Walk and the many missions. 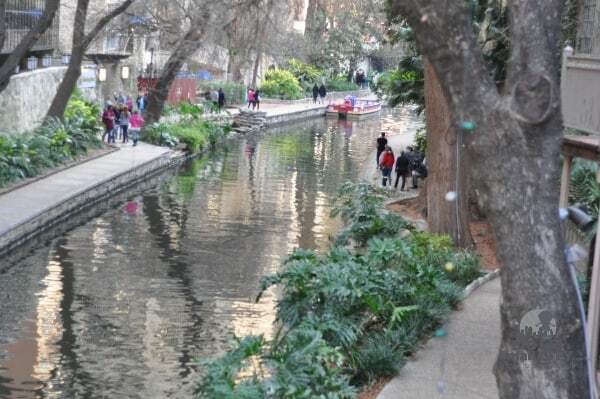 Take the Double Decker Bus Tour: This tour is similar to the trolley… but instead of the missions, you can see the museum reach part of the River Walk. It can get very very busy at Christmas, New Years and the Annual Football Bowl Game. The sidewalks get very very full the later the day gets… and I am certain one of us will fall into the river one of these days. Really. Many parts are just sidewalk and water. 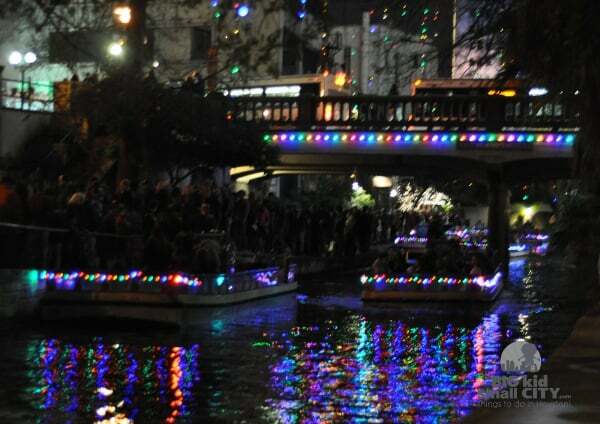 On busy nights, we generally stay off the River Walk. 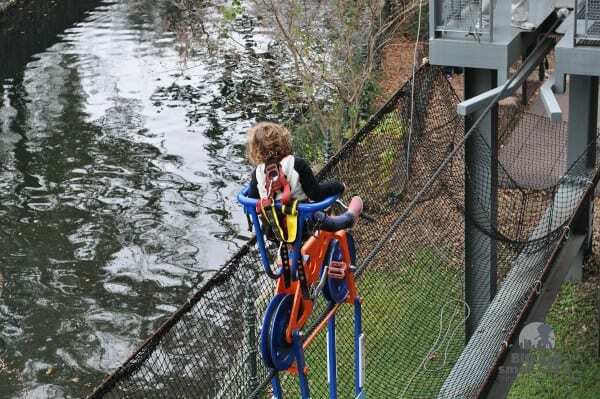 The River Walk is stroller accessible… but it is kind of a pain. You need to find the elevators or ramps… and have to squeeze on busy sidewalks. If you can use a carrier instead, do it! 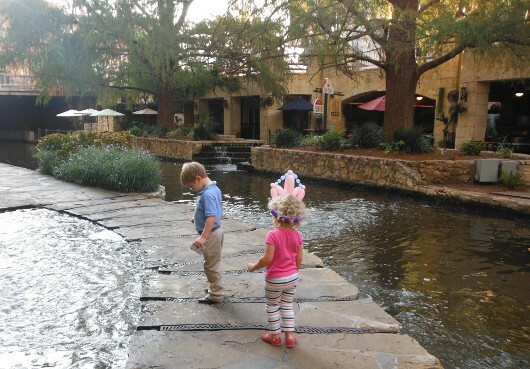 During the busy seasons, we really like to go to breakfast on the River Walk. The crowds are still at the hotels and a riverside table is perfect. Most years, the river is drained in early January for cleaning. Apparently they find lots of phones, jewelry, chairs and more. We usually pick just one tour… one boat or one bus tour… we do not do all 4 in one trip. That would take a lot of time and money. We’ve stayed at the Drury Inn at the Holiday Inn and most recently the Holiday Inn Express. The first two are right on the River Walk and the last one is a couple blocks away. We’ve decided we like the Holiday Inn Express best because it’s in the historic old jail building, has thick walls (and either had fewer people coming back from the bars… or we couldn’t hear them), high ceilings, is cheaper than the Holiday Inn and has free breakfast. It’s also very close to the Historic Market Square and Milam Park. We like the Farmer’s Market best… and (often) less crowded shopping and eating than the Downtown River Walk! This is the part of town with beautiful old houses that I would really really like to live in. You can get here by walking down the River Walk Mission Reach, driving or taking the bus tour (but the buses cannot go into the actual neighborhood last we took them). No matter how you get here, it’s a great place to walk around and eat. Eat at Rosarios. We got this recommendation from a local… and it is great. Good food, quick service, reasonable prices… and staff that is willing to make something simple for the kids. There is no kids menu… but you can order plain tacos or quesadillas or whatever. This is a long walk from Downtown for kids… so in the past we have taken the bus tour to this stop, grabbed lunch and then make the long walk back along the river. Ride the Zoo Train. 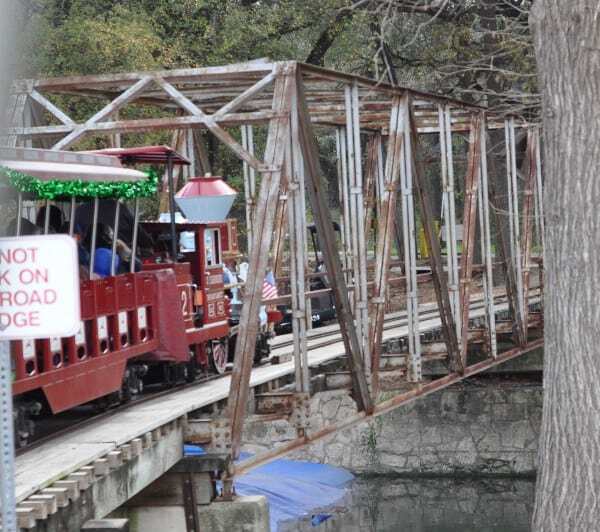 This is a good way to tour the park… and well, we love trains. Visit the Japanese Tea Garden. This is awesome! 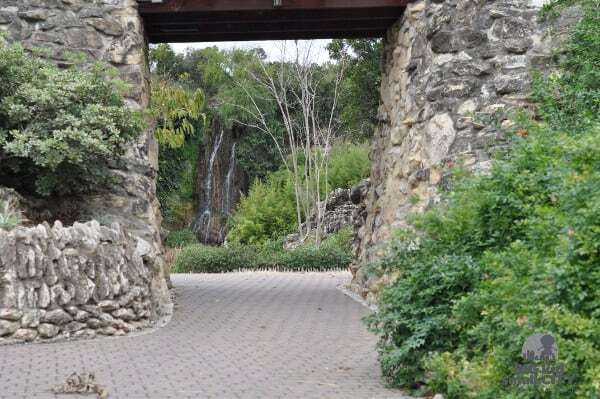 This garden is in an old rock quarry and has winding paths, rock walls, giant waterfall, koi ponds, bridges and so much more. And it’s free! Visit the Kiddie Park. We have never been to the Kiddie Park… but it’s an old fashioned amusement park for little kids. It’s open on weekends. Windcrest – This town to the Northeast has the best Christmas lights display. The town has a light-up contest each year with a specific theme. You can get a map of the award winners at the Windcrest fire station. The Magic Time Machine: The wait staff is dressed in various costumes (ours was Velma from Scooby Doo) and each little corner of the restaurant has a different theme. You can eat inside a giant pumpkin! 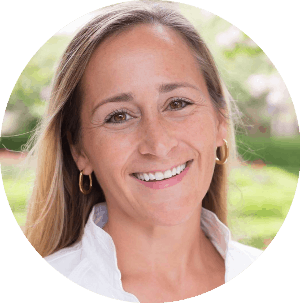 If you have an idea for something new, I’d love to hear it! Also, if you want to stay in north San Antonio, check out this amazing kid’s suite at the Omni. AND, if you are looking for more roadtrip ideas, go HERE! Add “The Magic Time Machine” to your list! 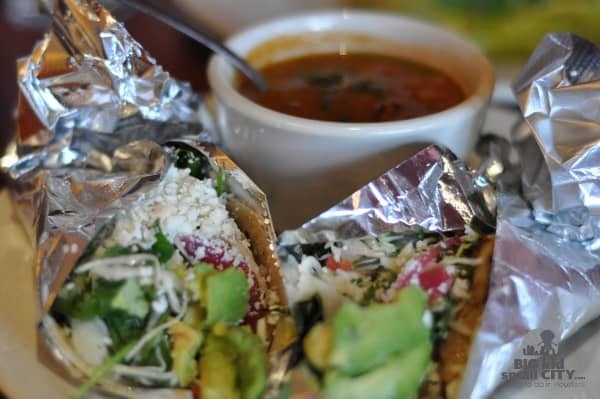 It is a restaurant about 9 miles from downtown San Antonio, but it is worth the drive. It’s a really unique restaurant in which all the wait-staff is dressed in various costumes (ours was Velma from Scooby Doo) and each little corner of the restaurant has a different theme. You can eat inside a giant pumpkin! Warning: if you ask a waitress where the restroom is, she will take you by the hand and lead you through all crowd saying, “Anyone else need to go potty? !” LOL. Thanks Joseph! We’ll be certain to do this on the next trip!!! (And not ask for the restroom!). Definately go to the Kiddee park! It is a must for kids…especially under the age of 7! Thanks so much for this. Sea Wold will never be an option for us!! I’m glad it helped! I like the city better than Sea World! Near the pearl there is a great Italian deli, Fratello’s Deli, that has great food and is family friendly. The McNay is also great for family pictures and art viewing.